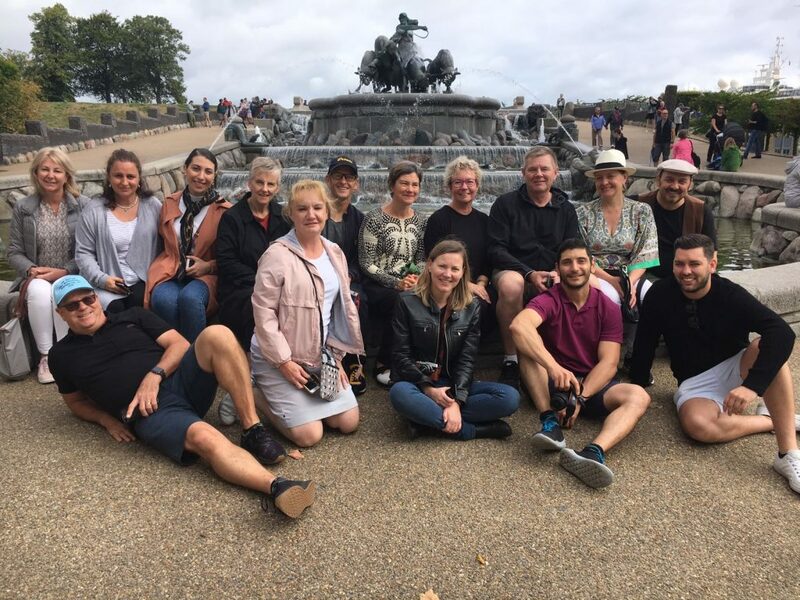 The start of August saw a group of 22 building designers and architects head to Scandinavia for the BDAV study tour of Sweden, Finland and Denmark. Known for its stunning landscapes, must-see natural attractions and relaxed way of life, the group was set to experience the unique architectural attractions each of these destinations had to offer. The tour began with four nights in the Swedish capital city of Stockholm, where the group toured through the old town of Gamla Stan, visited the world-famous Vasa museum and Skansen Park and took a trip out to the Swedish countryside. One highlight in Stockholm was the group dinner held at ‘Fem Sma Hus’ which is a restaurant serving classic Swedish food in nine separate tiled cellar vaults extending through five buildings. The visit to the UNESCO world heritage listed ‘Drottningholm Palace’ was a fine example of European architecture from the 1600s! After four nights in Stockholm the group travelled by ferry through the Stockholm Archipelago to Helsinki. The perfect weather allowed the group to sit out on the deck as we travelled through the cluster of 30,000 islands, skerries and rocks while enjoying a glass or two of wine. The arrival into Finland marked what was to be a busy few days looking at architecture, especially that of Alvar Aalto. Two nights in Helsinki, followed by a night in Tampere and two nights in the Finnish lake district at Jyvaskyla, had the group visiting some of Alvar Aalto’s most famous works including Finlandia Hall, Aalto House, Alvar Studio and the Muuratsalo Experimental House. In between the busy schedule a few members of the group even managed to squeeze in a game of golf set amidst the most delightful Finnish landscape. The tour the concluded with four nights in Copenhagen, where the group was staying in a heritage-listed 1780’s building located on the waterfront. The group visited the three central palaces, went through the canals on a boat tour, had lunch at the hippie town of Christiania and spent a day exploring the architectural district of Copenhagen called Copenhagen S. Here you will find the award-winning residential buildings VM Mountain and 8Tallet designed by architect Bjarke Ingels (BIG). The group visit we had to Villa Kokkonen on the outskirts of Helsinki, where the owners treated our group to a mini opera concert followed by homemade cake, tea and coffee. “We thoroughly enjoyed the trip. Will definitely do another, if not South America maybe the year after. You’re a credit to Impact, so adding in the awesome BDAV crew, it will be very easy to say “I’m in” again in future”. The countdown is on to the next study tour in May 2019 to South America. For more information on this, visit the event website at www.bdavsouthamerica.com.au.